KAYA Mattress Review - Best Hybrid premium mattress or Not? Home » Home & Garden » Bedding & Mattress » KAYA Mattress Review – Best Hybrid premium mattress ? KAYA Mattress Review – Best Hybrid premium mattress ? KAYA mattress review – one of the best and finest mattresses on the internet today. We spend much of our life sleeping, we should select the best luxurious mattress to sleep on. Here comes the KAYA mattress It is made of all the highest quality materials and meticulously designed by the best sleeping experts in the industry. support. Also, KAYA’s composition achieves a high level of durability. This 11-inch high mattress includes a 5 PCF top layer and the base layer of over 1000 pocketed coils delivers the ultimate benefits of a premium mattress. Its second layer includes 2 inches of 4 PCF density of memory to complement the responsive foam of the first layer. The third layer includes transitional foam of a 1 inch 2 PCF dense layer between the second and coiled layer. Minimalminimizeransfer: This KAYA mattress comes with 1000 individually pocketed coils that minimize the motion transfer of the bed. This means everyone has their own favorite sleeping positions. If your partner enters the end, it should not disturb your favorite position in this situation. The motion transfer of the mattress will be very low. That way, you won’t get any sort of disturbances even if someone enters the bed. 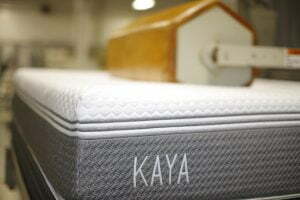 Firmness: KAYA is a medium-firm mattress, which is a very popular choice among consumers. It includes both a memory foam feel and supports your body with coils. It has a 6 out of 10 firmness, with 10 being a cement floor. Advanced Body Contouring & Edge Support: This mattress provides ultimate benefits when you sleep. It also is designed with the advanced body contouring for a better good night’s sleep. The edge support this mattress is designed with is pocketed coils that gives edge support. This way, you can sleep in any corner of the mattress. ThermoGel Technology: The KAYA mattress is developed using this cooling technology, and this mattress provides more cooling than any other mattress. The knit cover is infused with ThermoGel to begin cooling after sensing moisture and heat on the skin. This is one of the best cooling mattresses. Once you sleep on it, you will definitely feel the comfort. Conclusion: One of the best and advanced featured mattresses that is made in the USA, made with the highest materials, and priced under $1000 dollars for a queen. KAYA will ship you the mattress free, but if you aren’t sure about the mattress after a 120 day free trial period, you can return it risk-free. They also cover you for 20 years of warranty. Once you buy, you will definitely feel that this mattress is worth the money. One of the best and advanced featured mattress that is available at the lowest price. Once you buy you will definitely feel that this mattress is worth the money.